The recent White House Correspondence Dinner was referred to as a "nerd prom" which, from my vantage point, is a bit of an insult to both nerds AND proms. No Daliks, no lightsabers, no taped glasses or dweebs sitting in the corner sniffing Sharpies. Not in Washington. In Chicago, however, there are events that fit far more comfortably in the "nerd prom" category and I&apos;m here to clue you in on a few. 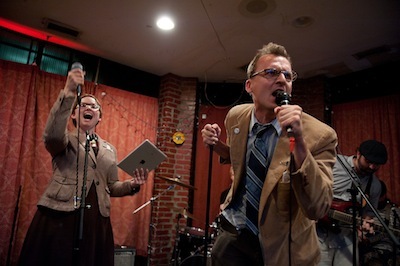 Chicago poets, Robbie Q. Telfer and Shanny Jean Maney, founded The Encyclopedia Show in 2008. In five short years, these two co-hosts (along with a plethora of collaborators) have peeled back the veneer of polite research and exposed their audience to detailed (and often funny) live encyclopedia entries about Fungi, Cheerleading, Skyscrapers, Puberty and Punctuation among many, many other topics you were dying to know about without ever asking the question. Tomorrow night (Thursday, May 2) The Encylopedia Show (with the help of Nina Coombs, George Decelles, and others) presents everything you could possibly want to know about The Origins of Life. Cheap tickets, a great time and you might be a tad smarter when you leave. And I think Telfer will be wearing a wrist corsage. Tonight (Wednesday, May 1) at the Music Box Theater, The Sound Opinions at the Movies series continues with Wattstax, Mel Stuart&apos;s 1973 documentary chronicling the legendary Stax Records-sponsored Watts Summer Music Festival. Wattstax gives you a front-row seat to history-making performances by Stax Records stars including The Staples Singers, The Bar-Kays, Luther Ingram, Rufus Thomas, and Isaac Hayes. And while those cats were definitely NOT nerds, Jim and Greg are, without question. And, finally, there is the Cinematic Debut of the cinecast of Wait Wait...Don&apos;t Tell Me! at...a theater near you. Also known as Sagal&apos;s Folly, your favorite public radio news quiz is performing in New York but being broadcast across the nation into movie theaters - like those operas they show sometimes but without an ounce of the culture. Well, except that the Not My Job Guest will be Steve Martin. He became more cultured once he started writing books. So, go rent that powder blue tux, buy your date a Star Trek-themed flower arrangement and head to any one of these appropriately labeled "nerd proms." Then go to your parents house at 3AM for breakfast.